I had such an awesome birthday celebration!!! Wowie!!! It just kept going and going, much like the energizer bunny! 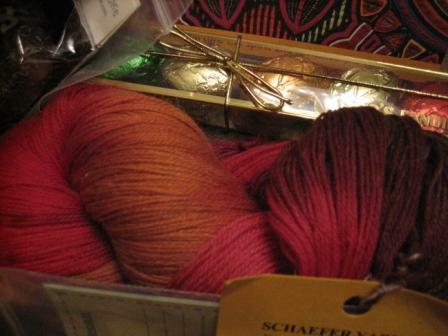 A stunningly gorgeous skein of Schaeffer 'Anne' yarn in colors to make a dyed in the wool autumn girl like me go weak in the knees!!!! Thank you, thank you, thank you!!! Did you see the chocolate leaves in the back of the photo...yum!!! There were two, TWO! 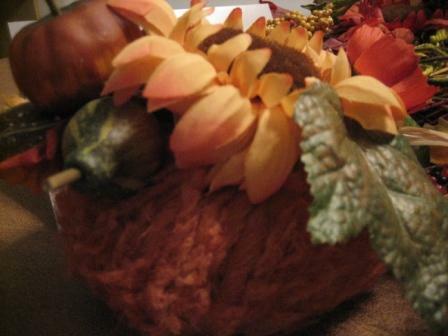 !, pumpkin yarn decorations...you guys are amazing!!! It's a long story, but suffice it to say, I had been fiending after these particular fall decorations after seeing them on display in a LYS with Jen just before the big bash. And now I have two, TWO!!! with some greenery to spare!!! Oh, yippy skippy!! 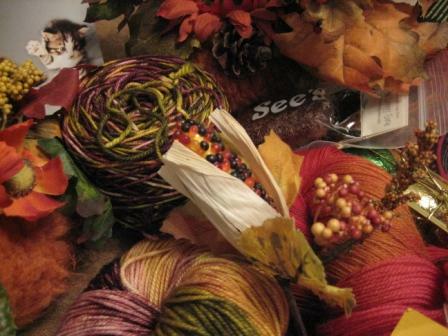 and see that ball of yarn in the back near the Sees candy (more yum! 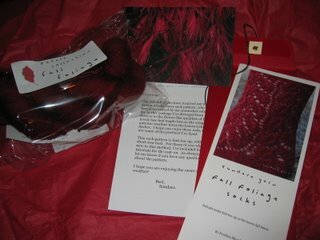 )...And the skein in the front...two, TWO!!! 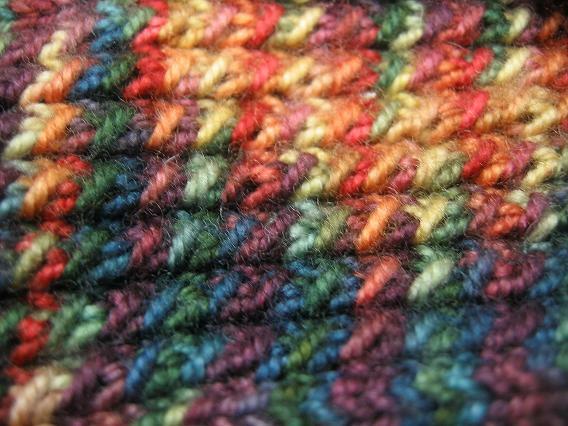 lovely skeins of Sundara yarn in 'Drunken Plum' in the sport merino! 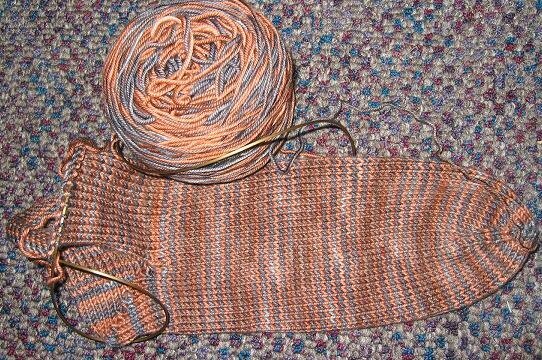 I have already started the toe...pics to follow soon!! It is soo soft and gorgeous...Oh my word!!! 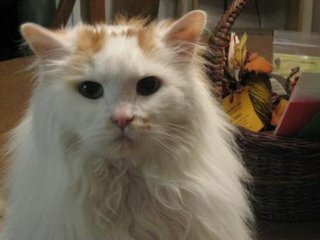 And here is our dear sweet Gibson (Giving his Viking kitty impersonation here) standing guard over my stash!! :) See those zip lock envelopes in the basket...needle inventory cards!!! Way too cool!! On Saturday, Jen, Iris and Shannon and I went up to Tina's for a Blue Moon Halloween Ball!! Too fun!!! That night Pete presented me with a cake (personalized above) and Raspberry champagne to match the dotted-swiss pattern on the cake (the same as on our wedding cake)!! Isn't he sweet and perfect...everyone together now...."He's a keeper!" And on Sunday, Pete and I and my two sisters hooked up and went to see a move (the Departed), dinner and had more birthday cake (double yummy)!! Thank you everyone for such an awesome celebration!!! I had a blast!! First things first....Happy Birthday NK! All of here at W.H.Y. are wishing you all the best on this day and each day this next year! 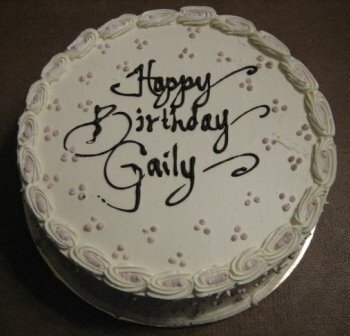 Hopefully your birthday was filled with wonderful, happy, memorable moments. We all love you! 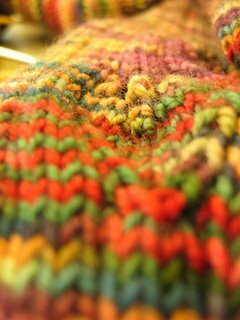 Last week we all got together to celebrate NK's birthday at our local Abundant Yarn. 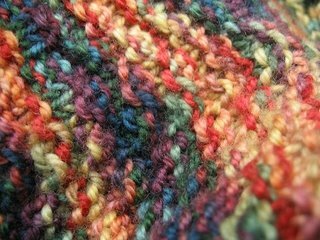 What a great time it was - knitting with friends, watching NK open her birthday presents, eating wonderful lemon ginger scones, sharing great stories. 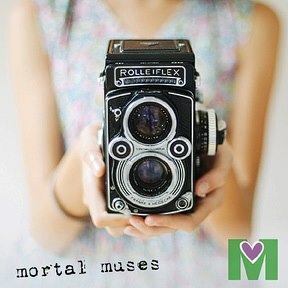 What a great group of girls we have in this blog of ours! And here's to you, NK! It was my job to post on our Rocktober socks last week - and as you can see, I'm a little behind on this. Sorry girls. Better late than never I always say! So, almost all of us are finished (no naming names), and WOW to each and every one! 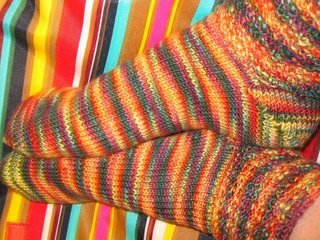 These socks are each 1 of a kind~each pair a completely different pattern, but each just perfect. Picot hogging all the flash!!! 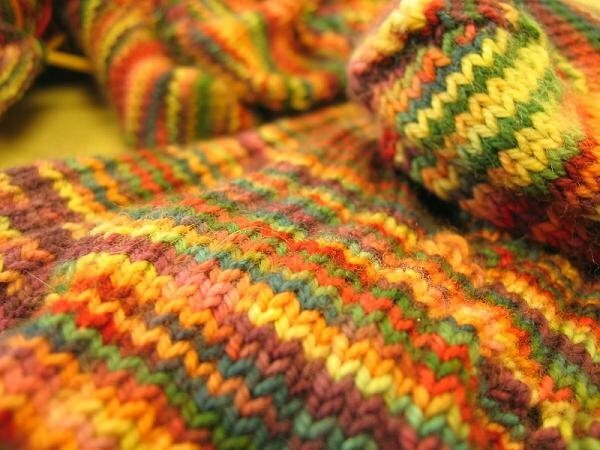 The stripes and colors just speak for themselves! NK's leaf patterns are just stunning! agent s, the highly dangerous globe-trotting nefarious super-duper-under-cover sock warrior extraordinaire, was found murderized in her home last night, after a top-secret meeting and a pizza dinner. because of the training agent s has subjected herself to over the years, she has been able to elude assassination since the contract went out on her head at the end of september. her first assasssin was taken out by a rival faction, and then the trail went cold. she was not expecting this hit to be so sudden, nor so brutal. in fact, she intimated to this reporter just last week that she anticipated she would be able to fulfill a few more contracts herself before the war was over. the package containing the poison that was to kill her was sparsely marked. vanessa from sac-town, you have taken out one of this nation's premier hired killers. but there are others out there, so watch your back. So, once again, I've done a lot of knitting, but have little to show for it. 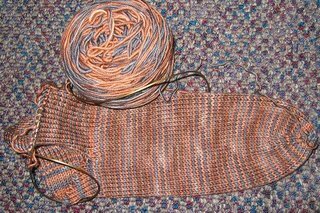 In my usual fashion I have knit the heel of my first sock about four times and then the first part of the cuff above that another 4 times trying to perfect the pattern and size. 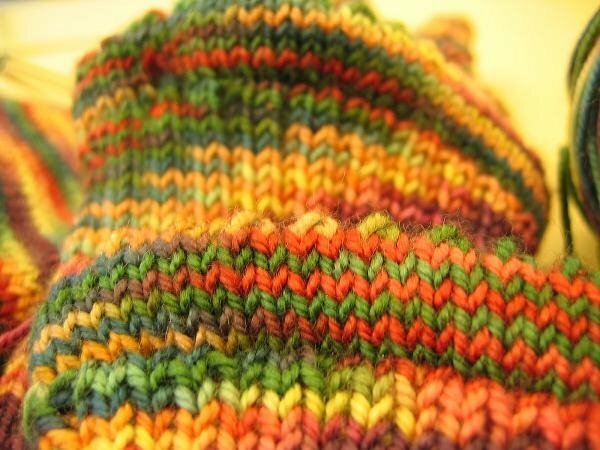 This doesn't so much bother me anymore since I have just accepted that I am a sock perfectionist. There I've said it. 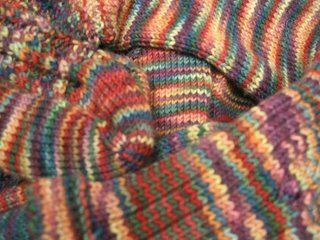 My name is Emily and I'm a sock perfectionist. 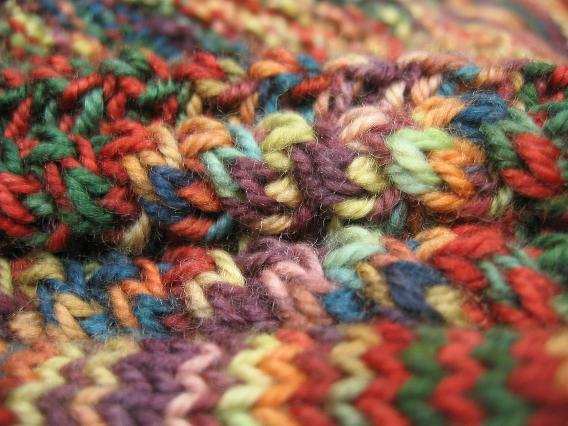 I'm not this way about hats or scarves or sweaters - I mean I'm more than willing to rip out a few rows to fix a mistake, but I'm not what you'd call obsessive. 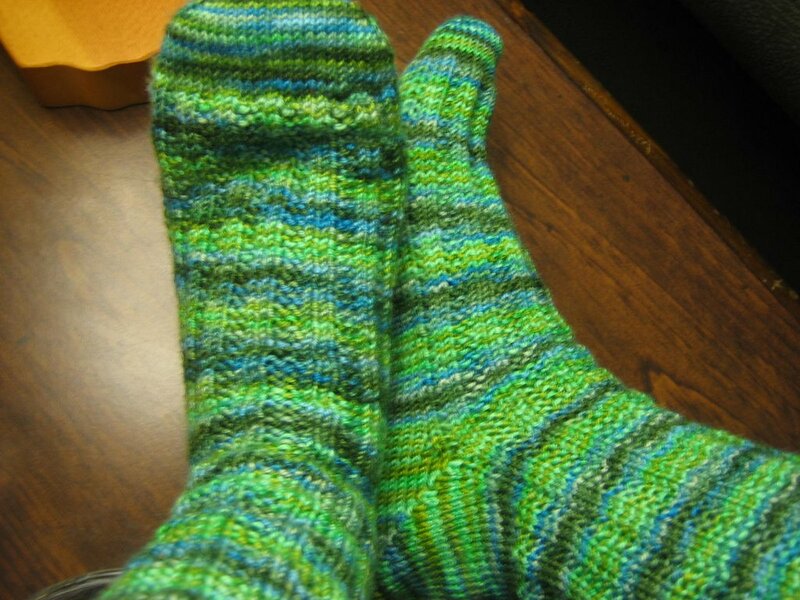 With socks, though, I definitely cross the line to obsessive. It is an item of clothing that I expect a lot out of. Anyway, having traversed the plains of froging once again, I now stand atop the peaks of acceptable sock-ness and am determined to pump these puppies out by 10/31. Anyway, since I am definitely the group's pokey little puppy again this week but also did work at it, I am posting a photo in which I am goofy looking, but for a very good reason. If I don't make the October finishing date then you'll get high school prom. Do you remember the Charlie Brown song "Happiness is...finding a pencil, learning to whistle, telling the time...Happiness is....two kinds of ice cream, five different crayons, learning to rhyme!" Charlie Brown ends the song with "Happiness is anyone and anything that is loved by you." Isn't that so true? Happiness, or my state of happiness I should say, encompases so many things these days. 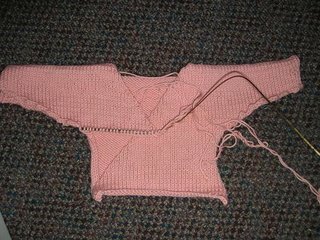 It explains my state of being when I'm knitting, that's for sure, but it also describes and entails so many more aspects of my life. I watch my dog sleeping, and that's happiness. I'm eating a piece of chocolate cake, and that's happiness. I'm sitting on the deck, iced tea in one hand, a good book in the other, sun peeping through the cedar slats of the deck, just enough to warm my legs - that's happiness. Paying off my visa balance - that's happiness. Watching a good movie and laughing so hard my ribs ache - that's happiness. And yet, happiness is so much more, isn't it? Happiness is biting into a great apple. It's the pucker your mouth makes when you bite into a Sour Patch Kid candy- the sour followed by the sweet taste of gummy bear. It's the smell of fresh baking bread in your oven on a Sunday afternoon - or better yet, taking the time to knead that dough into just the perfect loaf. And then being able to eat it hot, just out of the oven, with butter. That's true happiness. 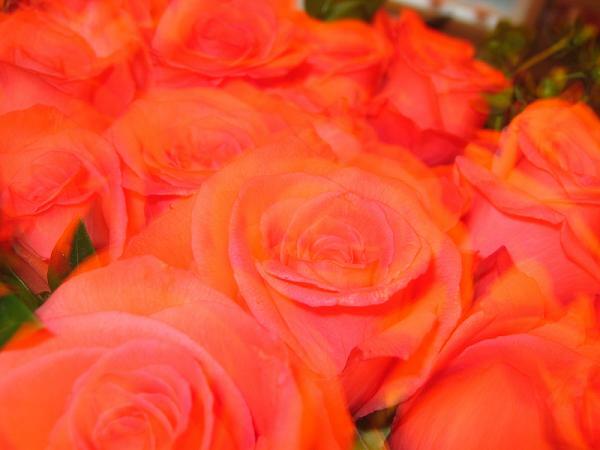 Arriving home after a long day at work and commuting, and being greeted by my extra "hot" and special husband with a bouquet of roses - that's happiness. Taking random photos of my cat, Snuggles, who, to me, is the most beautiful cat in the world and has a personality all his own- that's happiness. 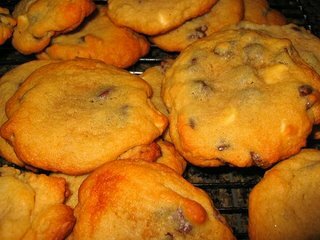 Baking a batch of chocolate chip cookies on a Saturday afternoon - the smell of chocolate and butter filling the house - that's happiness. Finishing a baby sweater for a good friend's new baby (who is due this month). That's happiness. 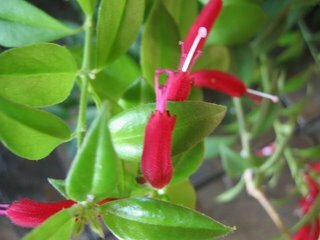 Watching my lipstick plant bloom after not having it bloom for 2 years....that's wonderful happiness! 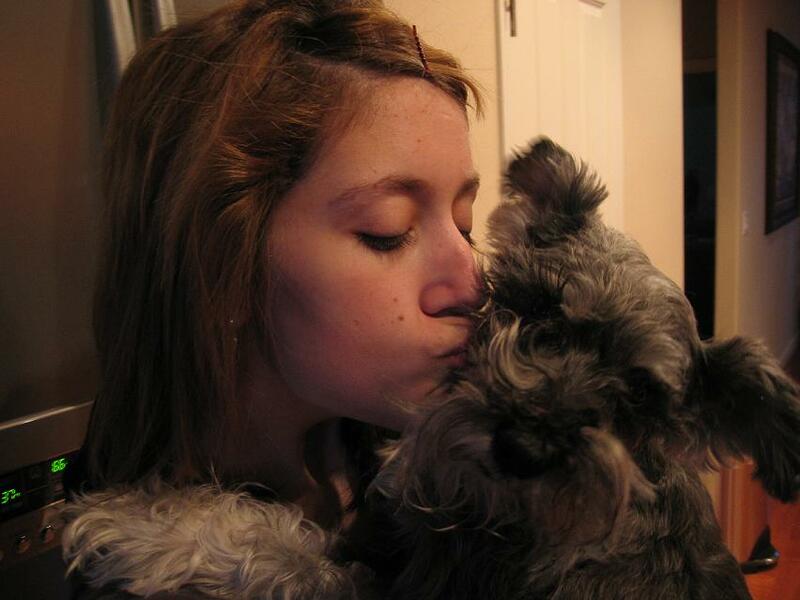 and seeing the love shared between my daughter and our puppy, Abby. That's happiness to me! Oh!Oh!Oh! Look what was in my mailbox Saturday morning!!! 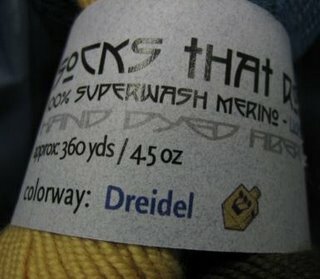 "Dreidel"!!! An awesome gift from Tina and Kaci!!! Thank you! Thank you! Thank you! The colorway is wonderful! And the sentiment behind it is priceless!!! I know it's a bit early yet, Hanukkah starts at sundown on December 15, but I'm going to be playing with my "Dreidel" sooner rather than later!! 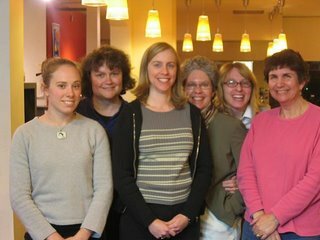 Let me introduce you to Iris, Julie, Woolgirl, Shannon, Neuroknitter, and Emily. We are friends, knitters, colleagues, and above all else--sock-a-holics. 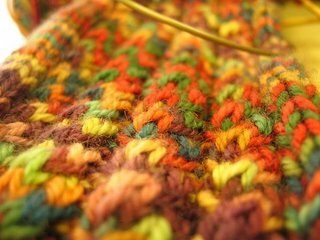 Some of us are new knitters, and some of us have been at it a wee bit longer. Some of us are newer to the joy of socks, some of us longer...but, we all heart socks (and each other) and we're all Socktoberfesting together!! And in the "heart" spirit that guides us here at W.H.Y., we are posting a joint meme! Just follow the colors to know who is "speaking"!! We hope you enjoy our meme!! first resource was Priscilla Gibson-Roberts book. 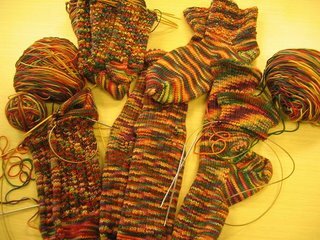 I started making socks a little over 1 year ago. Taught by friends. 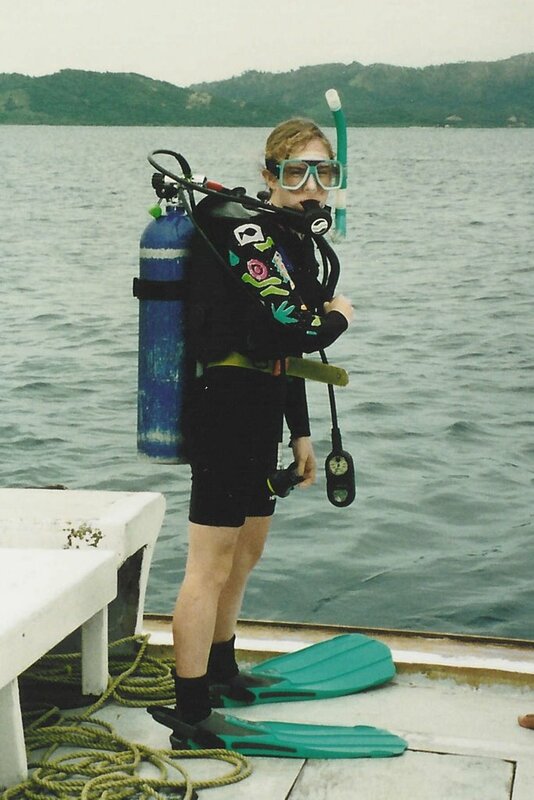 Around 1992. 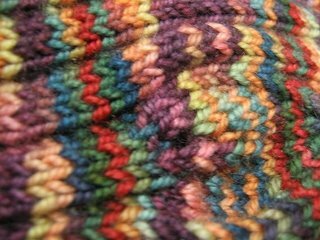 I took a class at my LYS with a friend. 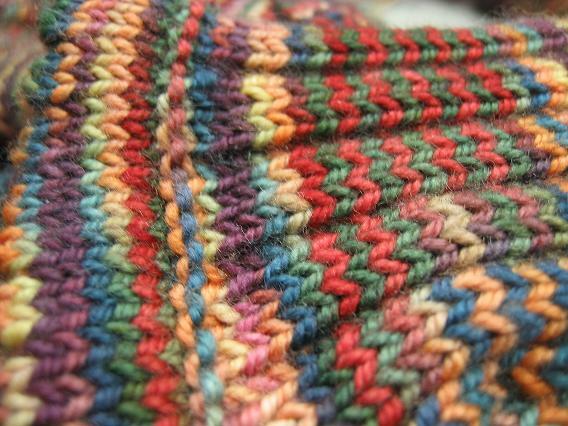 My husband bought me a sock book, needles and yarn for our first Christmas together when we were dating. 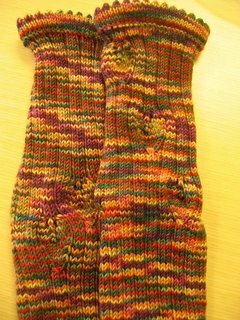 A pair of big (too big) socks for my mom - and yes, they have held up over time. They were very thick! aren't the first pair he puts on in the morning. 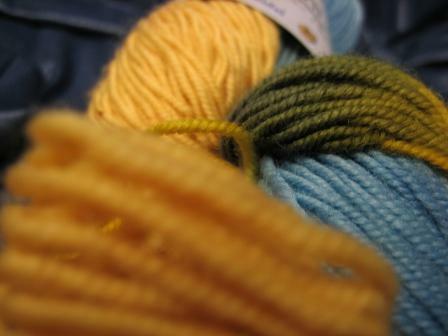 Light blue worsted weight Brown Sheep. 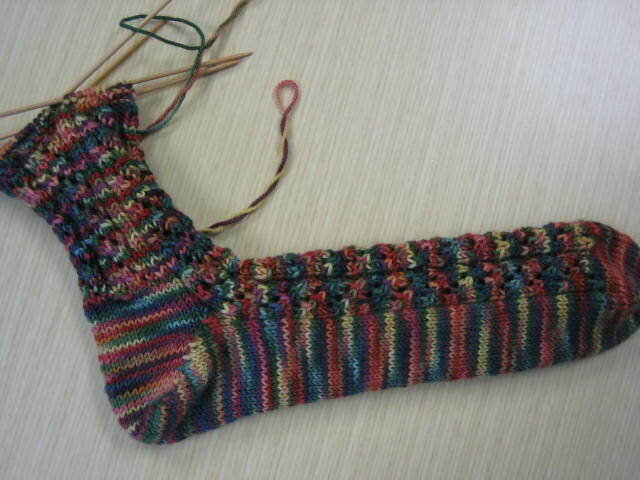 The first sock was way too small as my tension was way too tight. I was still getting used to the dpns! 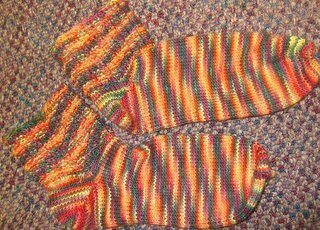 The second sock was great…As they were somewhat mismatched in size they were never worn and have held up great…heh-heh!! My first pair was an abomination. Didn’t even approximate fitting. I ripped it out. 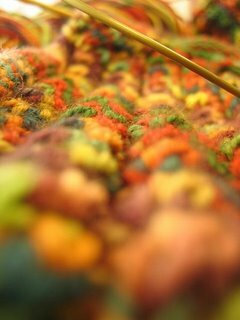 lightweight one); smaller needles. I had no idea what I was doing. 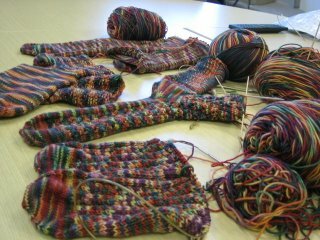 well, i have knit with a bunch of different sock yarns- koigu (overrated, in my opinion), knit picks merino(kind of soft), opal (kind of scratchy), and i willtell you that without a doubt, socks that rock spoiledme for anything else. that yarn is da bomb. seriously fabulous sock yarn, and not much stacks upwell against it. i do heart me some sock hop,though. 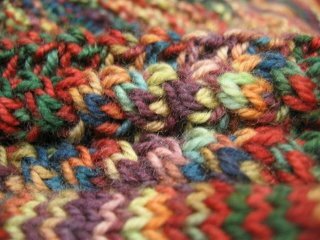 i have no clue how it wears, but it isgorgeous to look at and a pleasure to knit with. 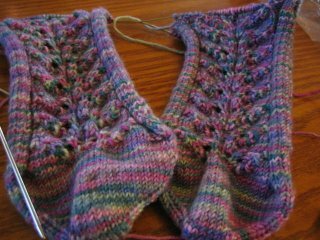 Historically: Galway and Cascade 220…mind you, I knit those worsted weight yarns on size 4 dpn for a nice tight fabric, with heels and toes on a 2 dpn!! In 1993 I learned to spin. 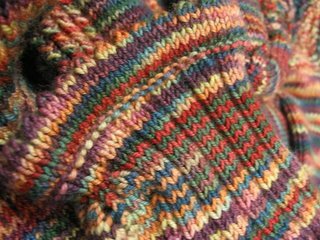 Somewhere before, during, or after that time, my friend Sandy Sitzman (owner of Woolgatherings) had her handspun from rainbow dyed roving and handknit socks published in the now infamous sock issue of Spin-Off magazine…Sandy’s ‘Happy Sock’ spinning kits turned me on to handspun socks…I have to say, handspun handknit socks are something quite special indeed. Currently, STR, SweetGeorgia, and Sundara are my faves…all those Ss…hmmm. back to one at a time. No crochet and magic loop all the way! long ones in each size. 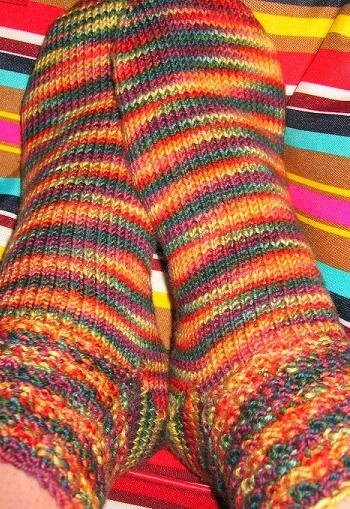 For me, crochet and socks don’t belong in the same sentence! I am a 1 needle in each hand kind of gal! 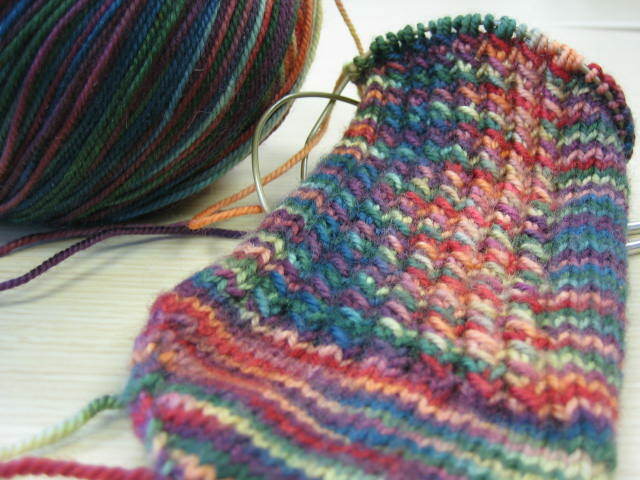 I have always knit them on dpns. I experimented with 2 circulars a few years back, but went back to dpns (wooden). 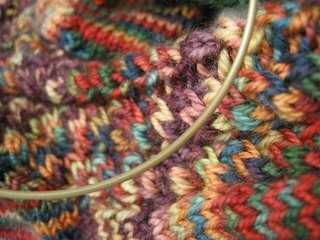 Recently, Shannon inspired me to reconsider 2 circs and from there I entered the world of the magic loop via Kaci. One sock, two socks...doesn’t matter; the magic loop is my current preference. I’m a big 2 circulars or ML proponent. Short row, but i haven't tried the flap. I like the look of the short row too much to switch. 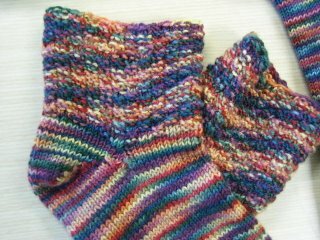 i started out making the traditional cuff-down,heel-flap socks, and they were just fine. 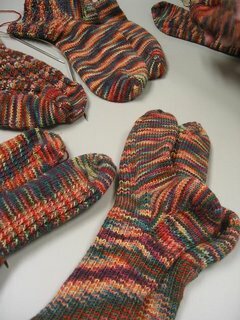 the flapfits well, grafting is not as hard as it may appear,and the socks i made that way have worn very well. 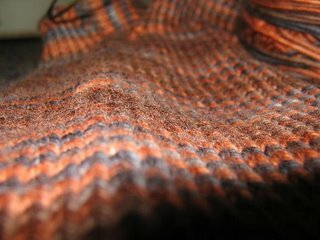 but then, THEN, i went to the oregon flock and fiberfestival in 2005, not only purchased my very firstsocks that rock (a bunch of it), BUT ALSO discovered atoe-up pattern written by someone who would eventuallybecome my blog-mate (hey, nk!). well, a trueobsession was born. i went to colorado for business,and one afternoon, sat for a few hours with str fireon the mountain, some lantern moon ebony dpns, andnk's pattern, and fell head-over-heels (pun definitelyintended) with toe-up short-row heels. it was amatter of weeks before i discovered the joy oftwo-at-once, double-circs, toe-up, short-row heelsocks, and, with the addition of the jaywalker crazesweeping blog-land, found a new love, an all-consumingpassion. I used to be a flap person. 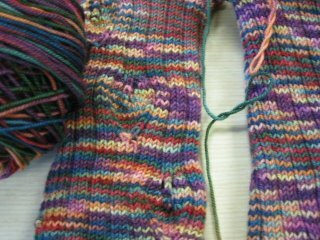 It took me years of reading Priscilla Gibson-Roberts’ Birkensock pattern before having my friend Jane hold my hand (and needles) through the ordeal of a short row heel. I haven’t looked back since! Thanks Jane!! I will do a heel flap if the overall look of the sock is enhanced in someway, otherwise, I will swap a flap for a short row heel. I’m in the middle of a heel crisis of conscience at the moment. 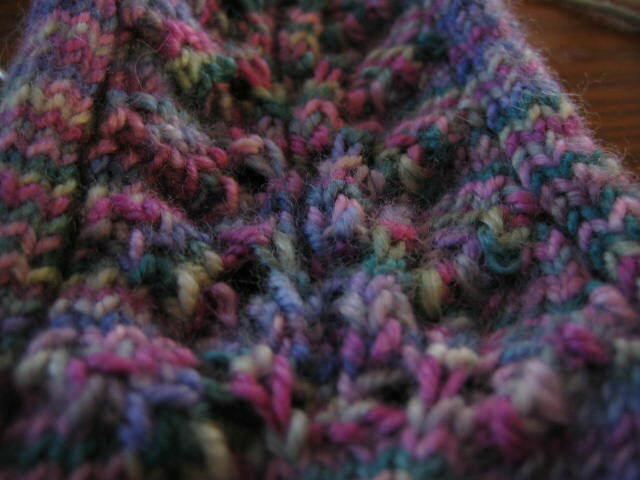 I like the look of the short row better, and I think it’s more fun to knit. However, flaps seem to fit my foot better, so I may convert. Pairs made?? 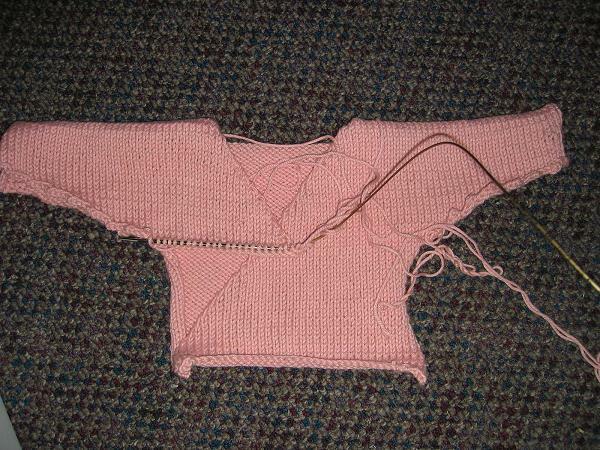 Ummmmmmmmm...10, with 3 on the needles. 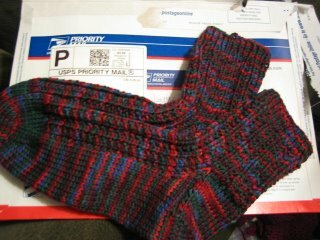 I'm on my 3rd pair and have a 4th waiting to be made. in 2006, i have made 17.5 pairs of adult socks, and1.5 pairs of babysocks. (i finished the socksofdoom2.0 last night). prior to that, hmm, let's see, 2 pairs for s, one pair for my papa, a pair for me, apair for my sister, and a pair for wg. OH, and thebane socks. and a pair of jaywalkers. so that makes 26 pairs of socks. i think. plus the babysocks. TNTC (too numerous to count)! ROTFLOL!!! I have completed over 16 pairs this year alone. On average I would knit at least one to two pairs a month over the last 13-14 years…I’ll let someone else do the math…I’m buckling under the realization that I’ve been knitting socks non-stop for 13 years…yes, you might call me obsessive, but I assure you I’m a well rounded obsessive (hah!) 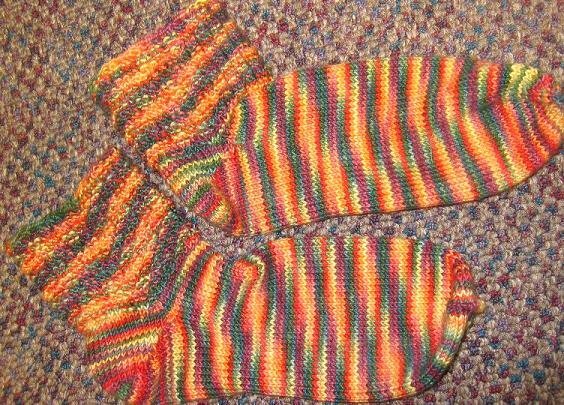 Many of my socks in the early years were gifted to my husband or my friend Linda (who has since learned to knit and to knit socks!!). 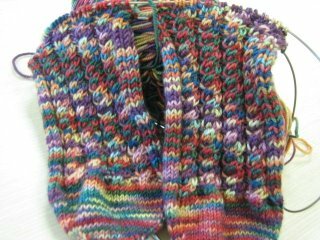 I still have most of the ones I knit for myself, too… (and they have held up well). I know I have enough STR socks to wear nearly everyday to work for almost a month!! the strangest thing happened a few weekends ago, the perfect confluence of timing, luck, fate, and covetousness. i found a pattern to make my str sock club july yarn into. lemme back up just a bit. a few posts ago, i lamented the fact that i was giving up on the hippie-crunchies. i felt bad. i have met a pair or two of these, and they are quite lovely, i must admit. but, i have been all about "being honest with myself" lately. 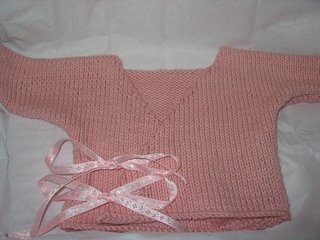 starting small - i just could not see myself knitting it. too much concentration necessary. so i frogged. i put the yarn down. i ignored it. fast-forward a week or so. it was a saturday. i was out most of the day, and arrived home to find the newest str kit waiting for me. i ripped it open, practically salivating, because, you know how magnificent it is to get a real, honest-to-goodness package in the mail, to push past all of that crap, all of those bills, those credit card applications, the pleas for money, the junk mail, and actually get something addressed to you that is PERSONAL?!?!??? and, if it's yarn on top of all that, well, there it is, the hot fudge sauce on the ice cream sundae of your day. as i sat at the dining room table, fondling the new yarn, rubbing it on my face, sniffing it, loving it, i heard a little squeak. so quiet that i almost ignored it. there it was again - peaseblossom was calling me, ever so faintly, from her basket. 'why are you forsaking me?' she asked. 'what have i done to make you angry?' 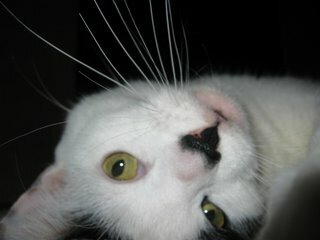 and when i didn't acknowledge her, a little louder, "WTF, S, are you gonna ignore me now???" what could i do? i put titania down, gently, and pulled peaseblossom out. i sat her down, and i asked her, what do you want to be, my dear? 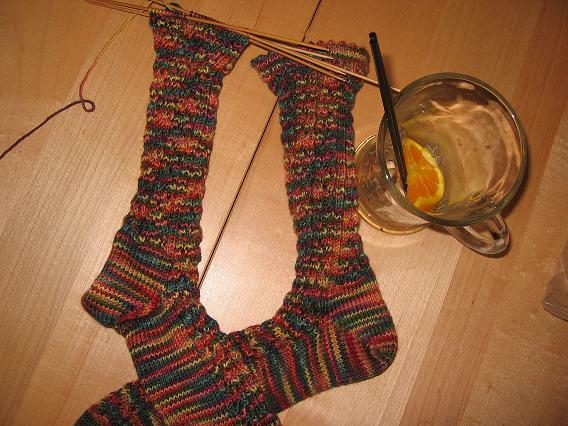 meanwhile, in another part of portland, e had been working on some breathtaking socks of her own. 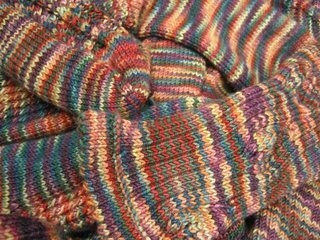 she began them on a midwest-bound plane ride and accomplished socktasticity. 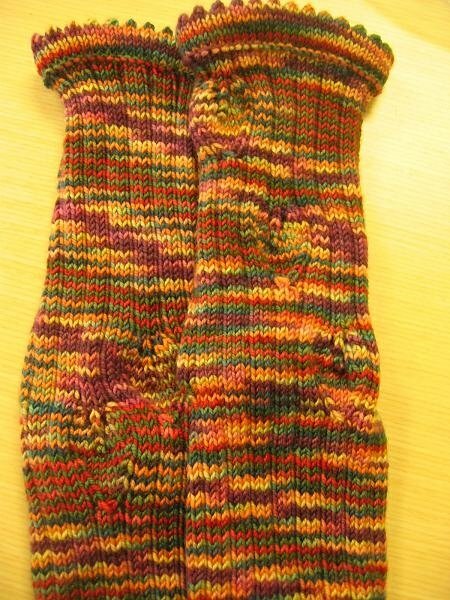 beaudelaire by, who else, cookie, the masteress of sock patterns, in str amethyst. yummy. i had been coveting them earlier in the week, considering casting on for them, but it wasn't until i read through the information tina had included in the str kit that i realized fate was at work. i have killed my target, purly-q, with kindness and some purple socks of doom. i also have finished HER socks, for stickchicky, but have yet to receive an address to send them to. the socks at the top of the post? bday presents for s.